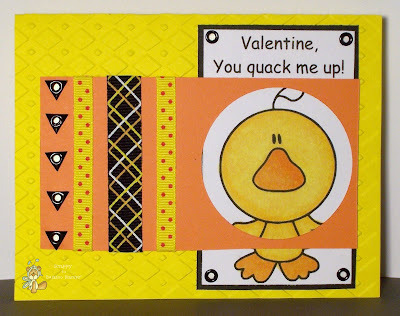 It's a Scrappy World: Valentines Post 1...I'm all quacked up! Fast forward to today: DD is still cranky from being sick yesterday, mommy has a horrendous headache and I'm blearily looking at pages of images I printed in the wee hours of the morning. However, this mommy is also stubborn to a fault (Read: Mama es loca)! Not only WILL I get these cards made in time for DD to hand out tommorrow, I will also endeavor to POST every one too! I'm sure that all her little friends will LOVE them right? Have I mentioned they are pretty much all under 5 years old? Oh yeah. CAR-AZY! Anywho...I'd better get on with it....so prepare for the barrage! The card below features one of Bugaboo Stamps Bobblehead Animals. The corny sentiment is courtesy of a brain scrambled by spending too much time with small children! (Yeah...I made it up, and giggled maniacally about it too! Sad ain't it!?) It is also made up exclusively of scraps including the base which was a recycled card. Be sure to keep checking in throughout tonight and tommorrow to see each unique card as I post them! Very cute. Love the bright colors. Thanks for joining us at Do You Stack Up. So cute! Thanks for joining us at Delicious Doodles Challenge with your great work! Good luck! I love corny sentiments, my type of project! It's great that you made this entirely from scraps and a recycled card! Another fabulous fun card Scrappy. This is gorgeous, love the colours. Thanks for joining in this weeks OSCC. Hugs Shelley.. Perfect use of ribbon, and what a cute ducky he is. Thanks for the bright dose of cheer today. Thank you for joining us over at The Pixie Cottage this week. Scrappy, you did it again... I love this card and the sentiment is perfect with this image. Thanks for joining us again at Pattie's Creations. Really cute layout and card. I hope you all feel better soon! You quack me up too! Very cute card and I love the Mother/Cardmaker instincts in overdrive!! You put a smile on my face. I’m glad you joined us for the DYSU RIBBONS challenge and hope to see you again! Very cute... and lovely yellow colour! What a cutie. Thanks for joining us at TG this week. This is too CUTE for words!!! LOVE your super cute image and the colours are simply lovely, love how it's not a traditional valentine's Day card, LOVE it! 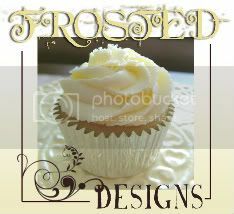 Thanks so much for playing along with us again at AnnaBelle Stamps! Cute card! Thanks for joining us at The Pixie Cottage! You did make me smile with your vision of the perfect mother /daughter time. Never seems to happen the way we picture it, eh? Love your valentine. It's great to see something in a different colour (and the sentiment is fab). Gorgeous! thanks so much for joining in our Birthday Celebration at OSAAT. Good luck! How cute is this card! !